This evening I went to a karaoke party. Most people make it a point to sing poorly when they do karaoke. Not me. Just can’t do it. So I brought along my “Wicked” karaoke cd and rocked my friends’ socks on “The Wizard and I.” Ah, I love to sing! This evening I had my second birthday dinner at my mom’s house. We had spaghetti and garlic bread and my mom did a great job on my al dente noodles – usually she cooks the noodles too long for my liking. We also watched “Philadelphia Story” together. Today I took a short nap after work, then I set on building a puzzle that my BFF Dawn got me for my birthday. 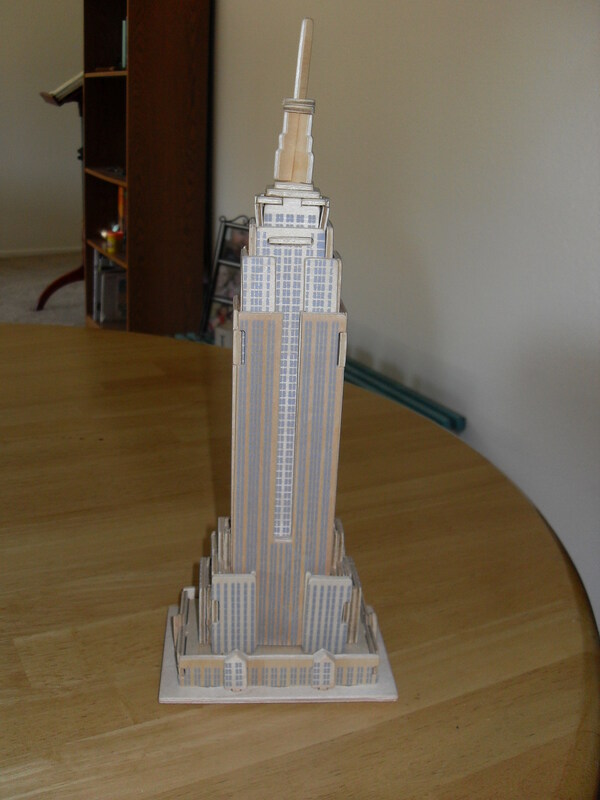 It’s a 3D model of the Empire State Building! She also got me the Statue of Liberty, but I haven’t put her together yet. Both puzzles will be great additions to the New York City theme I’ve got going on in my bedroom. I’m a little nervous that I’m running out of ideas of things to do to celebrate myself this month. I would love some suggestions! Posted in Mental Health and tagged adultitis, birthday, humor, inspiration, mental health, wellness. Bookmark the permalink. “Drugs are bad!” That was a great line during all the chaos. Saw it last night and loved it.